The 16 racial justice organizations that are currently part of Akonadi Foundation’s Arc Toward Justice Fund (ATJ) are building collective power to shape the policies and systems that affect communities of color in Oakland. We are lifting up the work of our ATJ grantees through our monthly spotlight series; for our July installment, we feature two of our grant partners: Ella Baker Center for Human Rights and Californians for Justice. 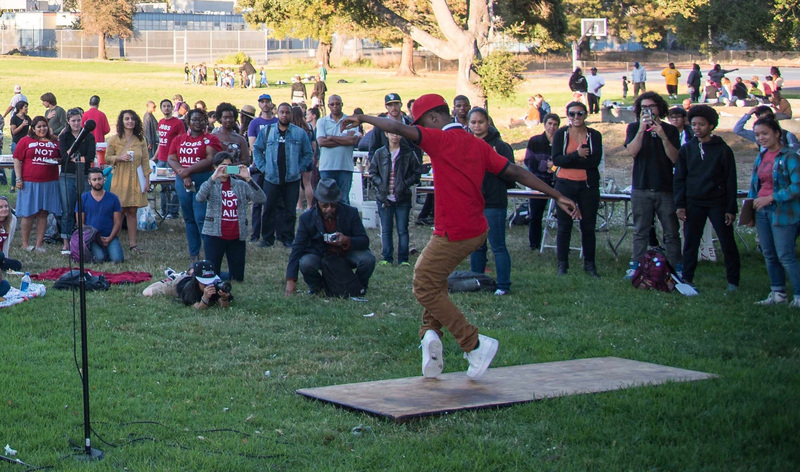 We spoke with EBC’s Jocelyn Wong and CFJ’s Chelsie Brooks about their organizations’ work in Oakland. Ella Baker Center for Human Rights: “Truth and Reinvestment” is our vision for our work; it is both a conversation and a call to action. “Truth” means confronting the reality of racial injustice in our country. It means illustrating how our country has continuously prioritized and profited from shackles, walls, and jails in communities of color – from slavery to Jim Crow to our current criminal justice system. “Reinvestment” means rejecting these priorities and advancing solutions that create opportunity for our families and neighborhoods. Too often, Oakland’s resources are wasted on punishment, policing, and prisons, creating real harm in our communities while failing to foster accountability. Truly supporting the possibility of redemption for every individual means acknowledging that a complete overhaul of our approach to criminal justice is long overdue. In a city where resources are invested in growth, redemption, and support, instead of punishment and prisons, we will all be able to reach our full potential. Californians for Justice: Californians for Justice believes that young people of color are the leaders we need to create the healthy, just and vibrant schools all of our communities deserve. We ensure that students have the opportunity to grow as leaders, and work with them to win campaigns so that every school and community can thrive. Our vision for education is that all youth of color feel heard and valued, and have a vision for quality education reflected in the classroom and the boardroom. We believe education is a human right and is integral to our community’s liberation, health, and self-determination. We believe public schools should empower youth with knowledge, skills, and hope, lead to college and career readiness, and fuel community participation. We believe in fighting for the right to a quality education for students of color, immigrant students, low-income students, LGBTQ students, and their families. We believe a quality education should provide a relevant curriculum, qualified and diverse teachers, and a healthy, safe, and environmentally-conscious learning environment. What current campaigns are you working on? Ella Baker Center: At the state level, we are working on bail and drug sentencing reform with a number of partners. Bail reform will help to ensure a more just system that does not punish poverty, will lead to more pre-trial releases, and ensure the least amount of interruption in people’s lives. The RISE Act will eliminate three-year drug sentencing enhancements for certain drug felonies, which will result in fewer years of incarceration for thousands of individuals, cost savings, and better plea deals for individuals. Locally, we are working with the Justice Reinvestment Coalition to fully implement the Jobs for Freedom campaign that will ensure that people with criminal records can access living wage, county jobs. We’re also hosting Prop 47 reclassification clinics to assist people in getting their records reclassified, and identifying and calculating local savings from Prop 47 in order to redirect them into community identified needs. Californians for Justice: Currently we are focused on three campaigns. 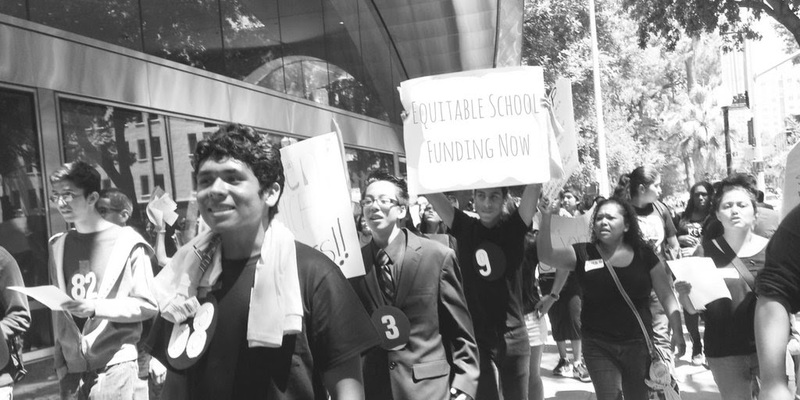 Equity, Transparency, and Accountability in School Funding – In 2013, we helped to pass the historic Local Control Funding Formula to drive more resources to students of color, addressing decades of disparate school funding. Our role since then has been to ensure that districts are being held accountable to equitable spending and involving youth and parents in funding decisions through structures like the Student Advisory Committees that our youth members won. Relationships Centered Schools – Our Relationship Centered Schools Campaign advocates for schools to: Invest in staff, focus on and value student voices, and create space for relationship building within schools. Youth Voice in Our Democracy – Our goals in engaging youth in democracy are to: increase the turnout of young adults in low-income communities of color to build their political power locally and statewide, and shift perceptions of youth and young adults of color so that they are seen accurately as active and responsible citizens. Our long term goal is to build a base of youth and young adults who have the skills and power to uplift a youth-led education justice platform locally and at the state level. Ella Baker Center: In addition to our work with the Justice Reinvestment Coalition, this fall, we will begin renovations on Restore Oakland, a joint initiative with Restaurant Opportunities Centers United. Located in the Fruitvale, Restore Oakland will be a community advocacy and training center that will empower Bay Area community members to transform our economic and justice systems and make a safe and secure future possible for themselves and for their families. Californians for Justice: In 2017, we are focused on local victories and implementation in our Relationship Centered Schools campaign. In 2015, our youth leaders completed a 10-month action research project where they surveyed 2000 youth across the state and interviewed over 60 teachers and school leaders. Their action research led to two clear findings: school staff and teachers are the most important resource students need to prepare them for college and careers, and students need more connections and empowerment. See the full report here. This research led to the launch of our Relationship Centered Schools campaign to value student voices, invest in staff, and create spaces for relationship building. Our campaign has changed policies, practices, and perceptions at both the local and state levels to create Relationship Centered Schools. In Oakland, where investing in relationship centered schools has been a district priority, the key challenge we are facing is the devastating teacher shortage. Seventy-five percent of California school districts do not have enough qualified teachers. Our youth leaders are committed to advancing policies that improve teacher recruitment, retention, and support in the Oakland Unified School District.